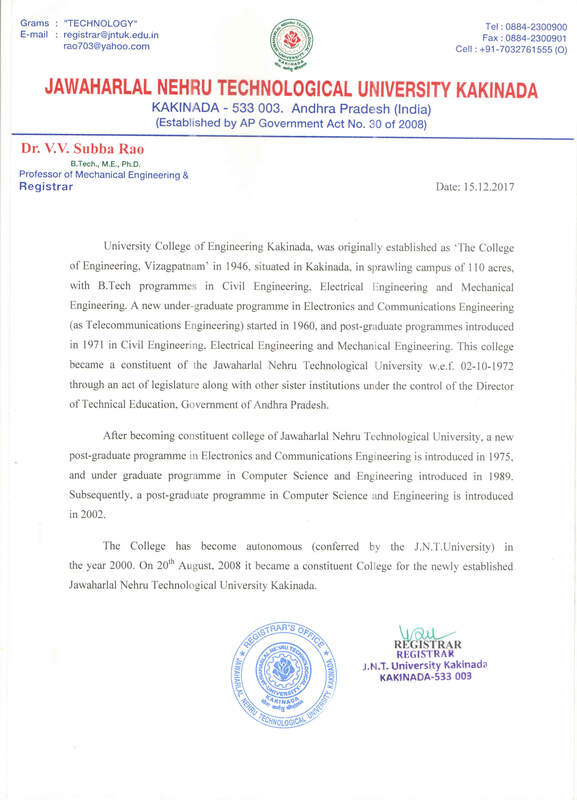 Department of Electrical and Electronics Engineering, Univercity College of Engineering JNTUK. Electrical science is one of the major contributors in the engineering field and its principles are involved in the design, development and construction of nearly all of the electrical, electronics and computing devices and systems. Continued research and development have led to better electronic and computing processes helping the mankind.The department provides the broad knowledge base required for engineers in present global industrial scenario. It takes the maximum advantage of the latest technologies and market opportunities to enrich the learners with updated and advanced know-how of modern technology. The main focus is concentrating on the significant modern developments in the electrical and electronics engineering. To be in the forefront in advanced research in emerging areas of Electrical & Electronics Engineering, be proactive with industry in technology development and mould the department into a centre of academic excellence. M1: To produce high quality Electrical and Electronics Engineering graduates with the requisite theoretical and practical knowledge. M2: To undertake research & development and extension activities in the field of Electrical and Electronics Engineering in the area of relevance for immediate application as well as for establishing and strengthening the fundamental knowledge. M3: To create social awareness and ethical values in the graduates so as to contribute in the progress of the society. PEO 1: To enable the students learn the fundamentals of Electrical and Electronics Engineering (EEE) very conceptually so that they can continuously update themselves in the context of growing technology. PEO 2 : To enable the students to adopt themselves in any socio-technological situation. PEO 3: To make the program rich in core subjects, so that the graduates in EEE can fit themselves in any relevant industry or pursue higher learning The graduates attain competitive skills to face the challenges of the real world. PEO 4: To introduce many soft electives in the program, so that the students can grow in the field of his /her personal interests with in the frame work of EEE. PEO 5 : To make the program accommodate very general subjects like Environmental Sciences, Professional Ethics etc., so that the EEE graduates develop a broad outlook useful to the community in general. PEO 6: To develop communication skills and leadership qualities, so that the candidates become leaders in the industry and academia. PEO 7: To inculcate research culture among the students by encouraging them to do projects either of fundamental nature or ones useful to industry. PEO 8: To motivate the students to become successful entrepreneurs to serve the society there by contributing to the development of the nation. PEO 1: To enable the students to learn primarily the concepts on electrical power transmission, utility, operation and control under the context of electrical power system engineering. PE0 2: To undertake research in the relevant fields of electric power system engineering to strengthen the abilities of the students for employability (or) to pursuit higher learning (or) to become frontier of the academia. PEO 3: To inculcate leadership and entrepreneur skills so as to enable the students to work in a collaborative and interdisciplinary environment. PEO 4: To become socially and ethically responsible and pursue life-long learning. PEO 1: To enable the students to learn primarily the concepts of high voltage engineering, working principles, planning, operation, testing and maintenance of the high voltage equipment and systems. PEO 2: To undertake research in high voltage engineering with emphasis on power systems to strengthen the abilities of the students for employability, to pursue higher learning and to become leaders of academia. PEO 3: To inculcate leadership and entrepreneurial skills in students to work in a collaborative and interdisciplinary environment. PEO 4: To make students socially and ethically responsible citizens and to promote life-long learning. PO 1: The candidate graduating as a well-rounded person. PO 2 : The EEE graduate is ready to take up any job either in the core industry or in allied disciplines. PO 3: The graduates attain competitive skills to face the challenges of the real world. PO 4: The graduates develop a techno ethical personality with a social responsibility to make a good citizen of the nation. PO 5: The graduate develops as a good entrepreneur. PO 6: The graduate develops an aptitude for lifelong learning. PO 1: The graduate will be able to acquire in depth knowledge in the area of electrical power system engineering. PO 2: The graduate will attain the lateral thinking and problem solving capabilities in the area of power system. PO 3: The graduate will obtain the capabilities of critical thinking, analyzing real world problems and handling the complexities to arrive feasible and optimal solutions considering societal and environmental factors. PO 4: The graduate will be able to extract information through literature survey and apply appropriate research methodologies, techniques and tools to solve power system problems. PO 5: The graduate will be able to use the state-of-the-art tools for modeling, simulation and analysis of problems related to power systems. PO 6: The graduate will attain the capability to contribute positively to collaborative and multidisciplinary research to achieve common goals. PO 7: The graduate will demonstrate knowledge and understanding of power system engineering and management principles and apply the same for efficiently carrying out projects with due consideration to economical and financial factors. PO 8: The graduate will be able to communicate confidently, make effective presentations and write good reports to engineering community and society. PO 9: The graduate will recognize the need for life-long learning and have the ability to do it independently. PO10: The graduate will become socially responsible and follow ethical practices to contribute to the community for sustainable development of society. PO11: The graduate will be able to independently observe and examine critically the outcomes of his actions and reflect on to make corrective measures subsequently and move forward positively by learning through mistakes. PO 1: The graduate will be able to acquire in depth knowledge in the area of high voltage engineering with emphasis on power system. PO 3: The graduate will be enabled with lateral thinking and problem solving capabilities in the area of high voltage engineering with emphasis on power system. PO 4: The graduate will be able to extract information through literature survey and apply appropriate research methodologies, techniques and tools to solve problems in high voltage engineering with emphasis on power system. PO 5: The graduate will be enabled to use the state-of-the-art tools for modelling, simulation and analysis of problems related to high voltage engineering. PO 7: The graduate will demonstrate knowledge and understanding of high voltage engineering with emphasis on power system and management principles and apply the same for efficiently carrying out projects with due consideration to economical and financial factors. PO 8: The graduate will be able to communicate confidently, make effective presentations and write effective reports to engineeringcommunity and society. 1 Mrs. Vijaya Bhanu Karri M.Tech. 10 Mr. NAMMI SAGARTEJAYADAV M.Tech. No new notifications for this department.